Fitness equipment doesn’t have to be bulky, complicated, or expensive. You can have an effective workout experience with a simple purchase of the dip stations. There are many designs out there for dip stations. Some are designed for a few exercises while others come with extra features to accommodate many different types of exercises. But in the end, all that matters is getting the right dip station to match your workout needs and be easy on your pocket. There are limitless options out there. However, not all of them perform accordingly. We have spent hours on research to review the top choices you might want to keep in mind on your next purchase. Without further ado, here’s a roundup of the best dip stations for your home gym. This is a solid dip station constructed of heavy gauge steel. A powder coat finish keep it free of scratches, rust and gives long-lasting durability. It has an oversized base designed for maximum stability during use. Non-slip rubber grips provide a comfortable grip that is easy on your hands. The base has non slip feet to keep the dip station from sliding and protect the floor. This dip station can be used to work the chest, triceps, and deltoids. A compact footprint saves space so it can be used even in small apartments. Get intense upper body workout with this dip station. 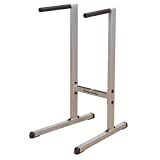 It is a durable gym equipment constructed of steel and iron to give solid support. It can accommodate users up to 500 pounds. An extended base gives a stable freestanding design to remove the need for any special installation. The arms are braced for extra support. The grip points are knurled to give a non-slip hold. A compact space-saving design means you require less space to accommodate it. You can use this dip station for working the shoulder, delts, and triceps. Want a dip station that accommodates two users at a go? Well, XMark dip station has got you covered. It has separate grip points for each user. The angled uprights are uniquely engineered to accommodate both men and women. A durable steel construction with protective powder coating gives enough strength to support up to 500 pounds. The base extends on both sides so that the dip station doesn’t tip during use. Non-slip feet are fitted on the base to keep it in place and safeguard the floor. This is a commercial grade dip station that will add a new dimension to your chest, triceps, and shoulders. 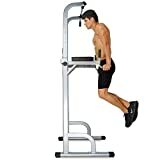 This lightweight dip station gives intense upper body workout without the burden. It is constructed of iron to give enough support for users up to 500 pounds. A black powder coating gives good resistance to rust and scratches. The lightweight body gives hassle-free mobility and a compact footprint saves space. The grip points are cushioned to give a comfortable grip that eliminates hand soreness. Non-slip caps are fitted on the extended base so the station doesn’t slide when in use. Ollieroo dip stand makes indoor exercise more user-friendly. A steel construction used on this dip stand gives a rugged support to accommodate users up to 425 pounds. Ergonomic handgrips with comfortable cushioning give a firm hold that is gentle on your hands. The handgrips sit parallel to each other for a uniform workout of the chest, shoulders, and triceps. The ends of the base are fitted with non-slip caps to prevent abrasion and damage to the floor. The base extends on both sides so you can lean towards the front without tipping over. This compact dip stand gives easy mobility yet remains tough to withstand intense regular workouts. It is made of iron to give a sturdy support to users up to 440 pounds. Effects of scratches and rust are reduced, thanks to a powder coat finish used on the iron surface. The grips are angled and fitted with non-slip rubber to give a firm, comfortable ergonomic grip. The base is made to extend on both sides to give increased stability and provide a solid freestanding installation. This is a dip station with a new dimension. Besides the grip bars, it comes with Olympic rings to accommodate multiple exercises. A larger percentage of the arms are cushioned to give a comfortable hold, even to users with larger hands. The uprights are slightly angled for effective chest and triceps exercises. An open pass-through design means less obstruction when maneuvering. Screwed-on joints make it easier to take apart for storage and transportation purposes. 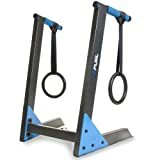 Why buy separate pull up and dip stations when you can get all in one gym equipment? Well, this power tower gives a good solution to that. 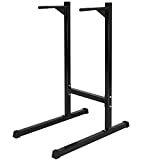 It can be extended in height to double as a pull-up station. 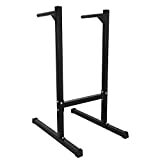 Besides pull-ups, this dip stand can be used for leg raise, chin-up, and press up exercises. The whole thing can be dismantled in just 2 minutes for easy conversion in no time. This power tower can support up to 240 pounds. A carry bag is included for easy transportation. This multi-functional power tower lets you enjoy limitless forms of exercises. Apart from a dip station, you can use for push up, pull up, chin up, and vertical knee raises exercises. 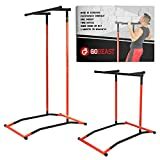 The height is adjustable to four different levels ranging from 5 feet 4 inches to 7 feet to accommodate all these exercises and match different user heights. Each grip point is cushioned to give a comfortable hold. 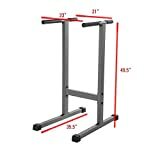 A high-strength steel construction used on this dip stand gives sturdy support for users up to 300 pounds. This versatile, multi-functional power tower lets you work out both the upper and lower body. 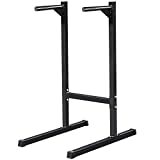 It is a 4-in-1 station for dip exercises, pull up, chin up, and leg raise exercises. There are multiple grip positions to suit the different exercises it is built for. The height of the tower can be adjusted to match user size. Sufficient padding is used on this power tower for increased user comfort. The base is extended to provide a sturdy freestanding support.